Combine dates, orange zest, apricots, vanilla, ground almonds, cinnamon, nutmeg and ginger in a food processor. Process until mixture is combined and looks like fine crumbs. Spoon the mixture into a large bowl. Add the orange juice, and then mix again. Pudding mix should come together when lightly hand-squeezed. 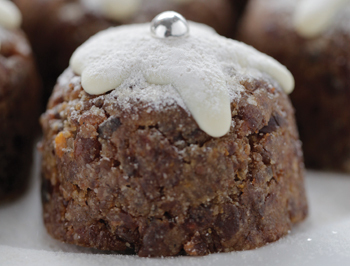 Divide into 6 small puddings. Line the base of 6 small decorative molds with plastic wrap and firmly press the puddings into them. Once firmly packed in the mold, invert the pudding and remove the plastic wrap. Melt white chocolate in a small bowl set over a simmering pot of water. Spoon a little white chocolate over the tops of the puddings if desired and garnish with goji berries, fresh cherries or another fanciful topper. Store in the refrigerator for up to 2 weeks. Serve puddings with chilled mango coconut custard. Combine all ingredients into a blender and blend until smooth. Serve chilled with the puddings.